A collaborative effort involving interdisciplinary domains from Dr. C. V. Srikanth and Dr. Vengadesan Krishnan addresses a fascinating mechanism involved in host-pathogen interactions. Several particularly problematic bacterial pathogens require a sophisticated type III secretion system, and a number of type III secreted effectors, to colonize their hosts and subsequently cause disease. Secreted effectors are key components of the bacterial arsenal, as they function in an orchestrated manner to highjack host vesicular transport system (VTS) and thus gain a suitable intracellular niche. In an earlier work Dr. Srikanth’s group had shown that Salmonella utilize SUMOylation, a post-translational modification pathway, for successful infection (Verma et al., MCB, 2015). The current work was an extension of these earlier investigations for gaining deeper understanding of the mechanisms by which SUMOylation governs Salmonella infection. They discovered a completely unexpected role of SUMOylation in governing the stability and function of a master regulator called Rab7 belonging to VTS. The study has unraveled that pathogen like Salmonella prevents the SUMOylation of Rab7 and thereby negatively regulate its GTPase activity making it a ‘dummy’ that can only be beneficial to the pathogen without doing it actual function. Together these results reveal a phenomenon that significantly widens the dimensions of our current understanding of Salmonella-pathogen interactions and could potentially be useful in addressing mechanistic details of related inflammatory illnesses of the gut including inflammatory bowel diseases. Image Description: Top: 3D view of Salmonella-induced filaments (green) formed within a host cell (nucleus shown in DAPI). 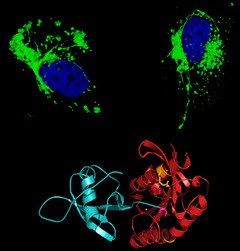 Bottom: Molecular docking of SUMO2 (sky blue) and Rab7 (red) structures.